Back to the nails! Starting from the little finger, I painted a pattern resembling Totoro's belly, a white (small) Totoro, a Totoro head, the makkuro kurosuke/dust bunnies, and then Totoro's body/grass on the thumb (トトロ is "Totoro" in katakana.) 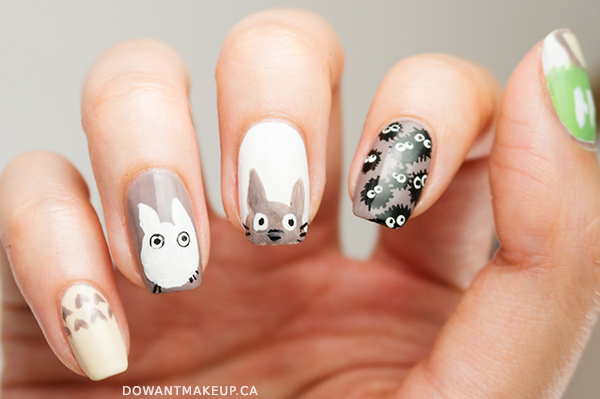 I used OPI Alpine Snow as a base for the white nails, to paint white Totoro, and for all the eyes. I used the buttery colour of Zoya Jacqueline as the base for the little finger and Totoro's belly, and Clinique Hula skirt for the green grass. 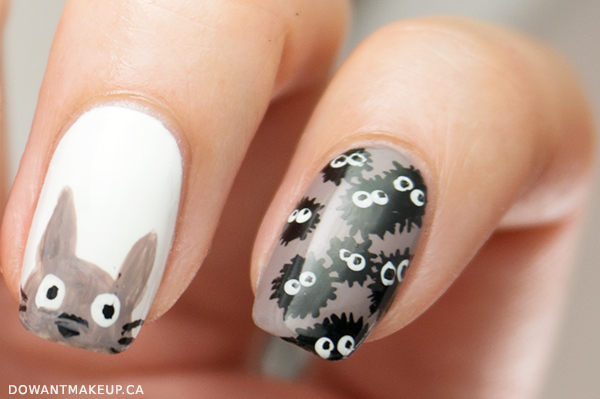 Revlon Stormy Night was used as the base for the ring finger and to paint Totoro's body. Black liquid acrylic paint was used for all the black bits. Unexpectedly, my favourite nail and the one that turned out the best was the dust bunnies nail on the index finger. Using liquid acrylic paint gave a pretty crisp and opaque look to their black bodies and I love how they're all over the place. I wouldn't mind doing an entire set of nails just swarming with them! 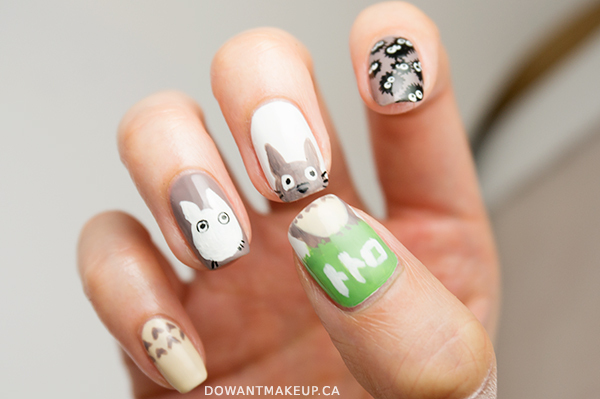 Have you watched My Neighbour Totoro? What's your favourite Miyazaki movie?